This 3 bedroom log home is on a wooded lot with access to the Lemonweir River. There is a wood-burning fireplace in the living room, full kitchen with open dining area, 2 bathrooms and lower level family room with dart board. Enjoy the screened-in porch and deck with a charcoal grill. Hike on the trails through the woods to sit & relax in the gazebo and enjoy the outdoor fire pit. This pet-friendly home has satellite TV/VCR/DVD and comes with a canoe. 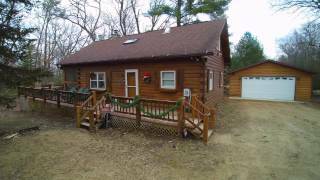 This is an ideal home for those who want to relax, yet it's only 15 minutes from downtown Dells. Peak season & Holiday - $240 per night and $1200. Value season - $216 per night and $1080 per week (Holidays excluded). Super Special- $204 per night and $1020 per week. I've been a Sand County customer for the last 7 years for all my winter weekend get away road trips. Thats how much I'm pleased with their service. I shouldn't recommend this home. I don't like having a hard time finding it available.The home has been the same one for the last 5 years. I used to stay at whatever home was available but since the first time we stayed at this one we accommodate our schedule to its availability. Thats how much we love it. We have used sand county vacation rentals for the past three years. We do the same trip every year for cranberry fest and we have never had a bad experience. It is always peaceful, beautiful, and relaxing!! The staff is great. Courteous, helpful, knowledgeable. They know the area well so they are always able to make any recommendations you need. Look forward to using them for years to come!! !